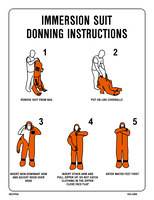 We imported many of our safety posters from Maritime Progress and print the rest in house. As of August 2015 we are closing out our Maritime Progress inventory. The prices shown are deeply discounted and are subject to stock on hand. 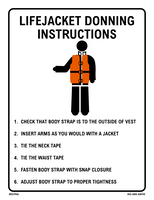 OPEN LIFEBOAT LAUNCHING POSTER / MP#1001W..APPROXIMATELY 13" X 19"
LIFEJACKET DONNING INSTRUCTION POSTER- HORSE COLLAR STYLE..8" X 10.5"
LIFEJACKET DONNING INSTRUCTION POSTER / KAPOK STYLE..8" X 10.5"
ENCLOSED SPACE ENTRY POSTER / MP#1006W..APPROXIMATELY 13" X 19"
VITAL ACT AFTER LIFERAFT LAUNCHING POSTER /MP#1003W..APPROXIMATELY 13" X 19"
MAN OVERBOARD POSTER / MP#1015W..APPROXIMATELY 13" X 19"
EMERGENCY MUSTER LIST POSTER / MP#1012X..APPROXIMATELY 11.7" X 16.5"
POST OIL SPILL ACTIONS POSTER / MP#1023W..APPROXIMATELY 13" X 19"
PREVENTING OIL SPILLS POSTER / MP#1008W..APPROXIMATELY 13" X 19"
GARBAGE POSTER / MP#1042Y..APPROXIMATELY 8.3" X 11.7"
PILOT CARD POSTER / MP#1011X..APPROXIMATELY 11.7" X 16.5"
DRUG WARNING NOTICE POSTER / MP#1037Y..APPROXIMATELY 8.3" X 11.7"
BUNKERING POSTER / MP#1022W..APPROXIMATELY 13" X 19"
ELECTRIC SHOCK/DROWNING ETC. POSTER / MP#1009W..APPROXIMATELY 13" X 19"
HOT WORK POSTER / MP#1024W..APPROXIMATELY 13" X 19"
LIGHT, SHAPE & SOUND SIGNALS POSTER / MP#1034W..APPROXIMATELY 13" X 19"
SOLAS #1 POSTER /MP#1058W..APPROXIMATELY 13" X 19"
DISCHARGE OF OIL POSTER / MP#1043Y..APPROXIMATELY 8.3" X 11.7"
WORKING ALOFT OR OUTBOARD POSTER / MP#1025W..APPROXIMATELY 13" X 19"
PERSONAL PROTECTIVE EQUIPMENT POSTER / MP#1028W..APPROXIMATELY 13" X 19"
CRANEAGE SAFETY POSTER / MP#1030W..APPROXIMATELY 13" X 19"
SELF CONTAINED BREATHING APPARATUS POSTER / MP#1047W..APPROXIMATELY 13" X 19"
ACCOMMODATION LADDERS POSTER /MP#1013W..APPROXIMATELY 13" X 19"
ABANDON SHIP POSTER / MP#1016W..APPROXIMATELY 13" X 19"
ENCLOSED SPACE TANK RESCUE POSTER / MP#1017W..APPROXIMATELY 13" X 19"
FIRE & EXPLOSION ACTIONS POSTER / MP#1031W..APPROXIMATELY 13" X 19"
REQUIRED BOARDING FOR PILOT POSTER / MP#1026X..APPROXIMATELY 11.7" X 16.5"
GAS BOTTLE HANDLING POSTER MP#1032W..APPROXIMATELY 13" X 19"
ENCLOSED SPACE ENTRY SAFETY SIGNS POSTER MP#1007W..APPROXIMATELY 13" X 19"
WHEELHOUSE POSTER W/PEN MP#1010X..APPROXIMATELY 16.5" X 11.7"
LIFEBOAT LAUNCH/DANGER ATMOSPHERE POSTER MP#1005W..APPROXIMATELY 13" X 19"
SHIPBOARD FOOD HYGIENE POSTER MP#1044W..APPROXIMATELY 13" X 19"
EVACUATION CHUTES & SLIDES POSTER MP#1046W..APPROXIMATELY 13" X 19"
FREE FALL LIFEBOAT LAUNCHING POSTER MP#1020W..APPROXIMATELY 13" X 19"
TOWING POSTER MP#1021W..APPROXIMATELY 13" X 19"
GANGWAYS POSTER MP#1014W..APPROXIMATELY 13" X 19"
HAZARD DIAMONDS POSTER MP#1048Y..APPROXIMATELY 8.3" X 11.7"
WELDING & FLAMECUTTING POSTER MP#1033W..APPROXIMATELY 13" X 19"
IMMERSION SUIT DONNING INSTRUCTION POSTER..8" X 10.5"